The OM-CP-TEMP1000P has been discontinued. Please see the OM-CP-HITEMP140-PT as a possible alternative or contact our Data Acquisition Engineering Department. The OM-CP-TEMP1000P temperature logger is a water proof, battery powered, stand-alone device used for automatically recording temperatures from -100 to 250°C. This all-in-one compact, portable, easy to use device will measure and record up to 32,767 temperature measurements. 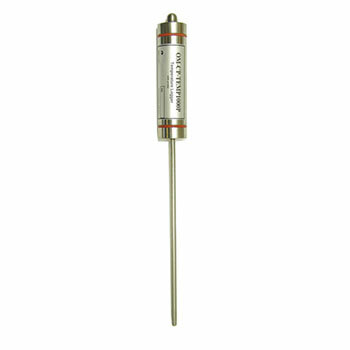 It includes an integral stainless steel temperature probe that provides a fast response time. The OM-CP-TEMP1000P is a major leap forward in both size and durability. Its real time clock ensures that all data is time and date stamped. The storage medium is non-volatile solid state memory, providing maximum data security even if the battery becomes discharged. Its small size allows it to fit almost anywhere. Data retrieval is simple. Plug it into an empty COM port and the easy to use Windows software does the rest. The software converts your PC into a real time strip chart recorder. Data can be printed in graphical or tabular format and can also be exported to a text or Microsoft Excel file. 참고: *Other probe lengths are available. Contact Engineering Department. Operator’s manual and USB interface cable are included with the OM-CP-IFC200 Windows software (software is required to operate the data logger and is sold separately). The entire data logger/probe assembly is not submersible. Only the probe portion can be immersed (do not immerse the probe past the joint area where it connects into the body of the data logger as this joint area can be penetrated by liquid).